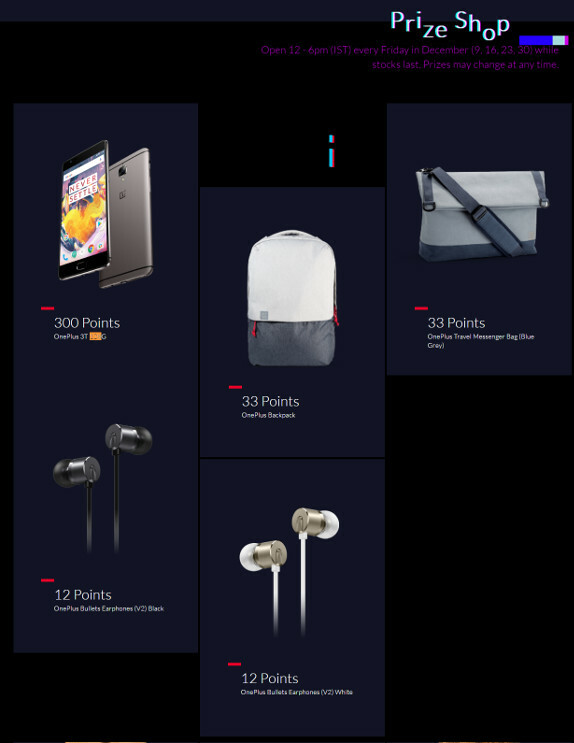 OnePlus has announced 3T December Dash that would let you win a OnePlus 3T 128GB version and OnePlus goodies every week for just Rs. 1 starting from 9th December. To enter you need to head over to oneplusstore.in/december and complete the Entry Challenge to get started. “There are over 30k prizes to be won. As an additional token of appreciation, those who entered the Diwali Dash will get bonus points, while new users who complete the entry challenge will automatically be inducted into a lucky draw and stand a chance to win one of three OnePlus 3T devices every week”, said OnePlus. If you register your OnePlus smartphone IMEI, and you get a Rs. 250 OnePlus coupon redeemable at the OnePlus India Store. All new users who complete the Entry Challenge stand a chance to win one of three OnePlus 3T devices every week. Complete the Entry Challenge and share this page before December 28. You gain 1 point for every person who signs up and completes the Entry Challenge through your share link. Use your points to claim your prize in the Prize Shop! The Prize Shop is open 12 - 6pm (IST) on every Friday in December (9, 16, 23, 30) while stocks last. Prizes may change at any time. Once you've claimed your prize, pay ₹ 1 within 3 hours to place your order. Prizes that are not paid for expire after 3 hours. You may claim any number of prizes, as long as you have enough points.